Surround speakers are designed to bring out the surround feel of DVD movies usually found only in movie theater showrooms. Bullets flying pass your head - helicopters flying out of the room, The PA-6S has been engineered to replicate these sounds perfectly. 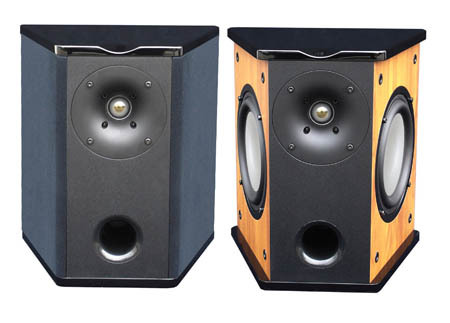 The alignment of two 6 1/2" polygraphite long throw woofers at roughly a 90 degrees angle, along with the front-firing tweeter makes the PA-6S is one of the cleanest sounding surround sound speakers on the market today. It is available in two stunning colors black or cherry. Both the top and bottom sides of the cabinet are also custom finished in a high gloss piano black lacquer. Not only does this speaker sound the best in its class, it will bring style to any room in your home.